MRS. W.T. HAYES: COURAGEOUS COOK OR BENEFACTOR? Who is Mrs. W.T. Hayes and why does she matter? The question has baffled me since my friend and Southern sage John Egerton generously gave me her mysterious little recipe book back in the late 1980’s. Now, finally, an answer. The chef fascination with pork belly is not news, but the thing I couldn’t help notice was that pork offal was all over the place, on menus, I mean. From a fabulous spicy Vietnamese Bahn Mi sandwich to a decadent Italian pork trippa (tripe) with soft cooked egg and salsa verde, creative expressions of unwanted pig parts ruled the day. Mrs. Hayes had been one of those imaginative and industrious cooks in her day, too, turning sows ears, tails, hoofs, intestines, and private parts into sustaining and delicious dishes. And fortunately her recipes were collected and recorded not as poverty or cabin food, but as signposts of excellence. I had to know more about this courageous woman who brazenly flaunted her race before the book-buying public, so I took a research trip — coincidentally funded by a grant from the IACP — to the Historical Society in Frankfort, Ky., to look for clues. What I discovered about Mrs. Hayes was better than the discovery of the book itself. The Kentucky Cook Book was published in St. Louis by the J.H. Tomkins Printing Company, a job printer, which occupied a small room on one floor of a commercial building in Missouri. It contained 45 pages of short recipes composed in the narrative style, and for the most part followed the paragraph form of Mrs. Reese Lillard’s Tennessee Cookbook, which came to print the same year. Strangely, only a fraction of Kentucky’s 250 dishes were characteristically Kentuckian. Just two hint at African American tradition – macaroni croquettes and okra salad (unless you count fried chicken, but I have covered that in earlier posts). The Library of Congress says the registered author of the Kentucky Cook Bookwas Mrs. Emma (Allen) Hayes, not the Mrs. W.T. Hayes identified in the Introduction. A search of the Kentucky Death Index turned up five women named Emma Hayes, and one man, a W.T. Hayes. Of the women who were the appropriate age, one Emma was married to W.T. Hayes. W.T. must have been a nickname for Allen, I thought; mystery solved. Well, that is until further investigation revealed that this Mr. And Mrs. Hayes were not colored. They were white. And I’m not sure it matters. Here’s why. 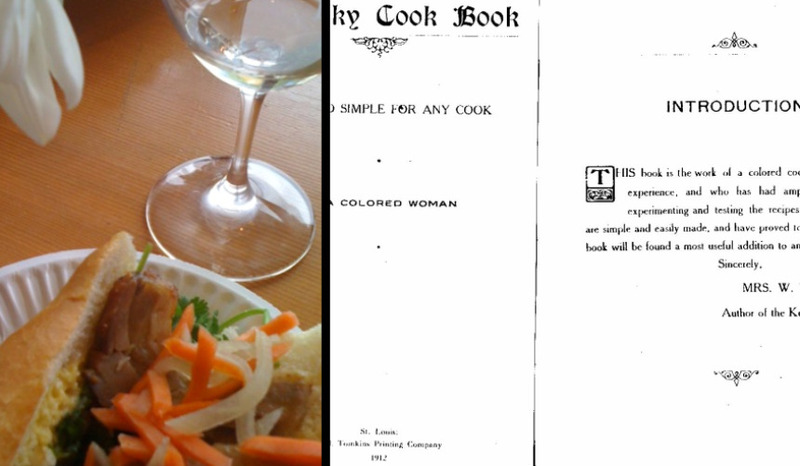 In a class of American cooks struggling for identity, Emma Hayes laid a foundation for future black cookbook authors, proving that great cooks can and did have vast repertoires that included but were not limited to foods from the fifth quarter. And, even if she was the white mistress who simply helped bring a black woman’s talent to the page, she joins the tiny band of supporters who boldly fought against the plantation cook stereotype by recording recipes and giving them credit for their mastery. Together these women crossed a dangerous social bridge when they rescued African American cooks from prejudiced interpretations of their character. And that truth leads to an appreciation for the rich culinary legacy created when – not one, but two – cultures came together over bubbling kettles of greens and skillets of pone to evolve an historically important and still beloved cuisine. Here is a recipe from the Kentucky Cook Book that hints at the tripe and egg nestled in a satiny tomato sauce we enjoyed today on wine tour. I wonder what wine Mrs. Hayes would recommend? After soaking a beef kidney in salt water over night, stew until tender and until little water is left in the kettle. Cut the kidney into small pieces and thicken with flour the water in which it was cooked. Add a tablespoon of butter and the kidney. Serve with boiled tomato and mushroom sauce on toast. Hi John, I’m still digging around in the archives, and so far, the evidence points in that direction. Please stay in touch and let me know what you find out. Fascinating stuff!